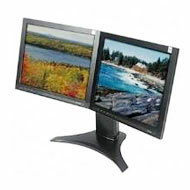 "Recent Windows and Mac computers (and some Linux systems) can operate with multiple monitors; with my computer's Windows XP operating system, it took only a few keystrokes and mouse movements to set things up. Once I saw how it improved my productivity, I was an instant convert. I should not have been surprised. Survey after survey shows that whether you measure your productivity in facts researched, alien spaceships vaporized, or articles written, adding an extra monitor will give your output a considerable boost — 20 percent to 30 percent, according to a survey by Jon Peddie Research." Find dual monitors on Amazon.com.